Looking at these two pictures reminds me just how far Jacob has come. 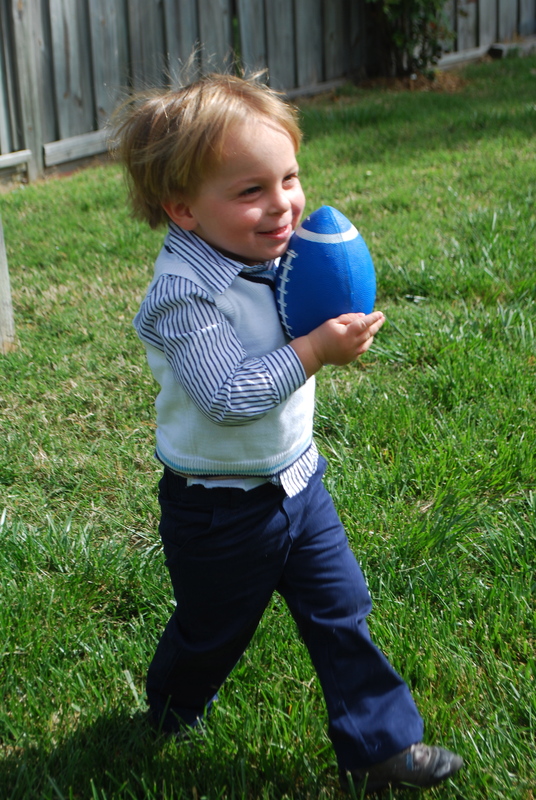 I wish I could have seen this picture of him running with a football when he was 11 months old and I was a frightened that he would never sit properly, crawl, or even walk. So many people encouraged me that it would come in time, and I believed them for the most part, but I still worried. Jacob’s gross motor skills have improved exponentially over the past year and a half. He walks and runs everywhere. He still falls quite often when on uneven surfaces, but we have been lucky in escaping any real injuries or trips to the Emergency Room. He is still in physical therapy through the school and privately, working on navigating surface changes, stairs (alternating feet up and going down safely), jumping, and overall core strength and flexibility. From initial appearances, Jacob looks like a pretty typical 2 and a half-year old, which is such a tremendous blessing and a relief. I feel like he will eventually be able to do everything his peers can do physically, even if it takes a lot more time and effort. Our biggest challenge over the past year has been Jacob’s speech delay. At the age of two, Jacob really was not talking at all. He said mama, dada, and Bella and that is about it. All of his therapists told us that children usually master gross motor skills before mastering fine motor skills, including speech. Since his gross motor development was so delayed, this somewhat explained his speech delay. He also needed to imitate sounds before he would be able to imitate words. At two, Jacob was delayed in a lot of his fine motor skills and really was not imitating much at all. He still was not clapping, not signing much (despite lots of effort on this), and not doing much fine motor play (block stacking, pop beads, etc.). He would gesture, point, grunt, and cry if he wanted something. Two-year olds can be challenging, moody, and difficult to understand anyway, but most two-year olds have a basic supply of words and/or signs to communicate their basic needs and wants. Jacob did not have this, which was leading to a tremendous amount of frustration on his part and ours. One of the great things about the Early Intervention program is that they are a direct link to the IEP and developmental preschool programs offered through public schools. A child can stay in the Early Intervention program until they are three, but it seems like they encourage you to get them in school for a more stimulating, therapy-rich environment than the few hours of at-home therapy you get through early intervention. Our daughter Isabella was in a Montessori school and we were very happy with the environment and the development we had seen there with her. I am a big proponent of Montessori education, but I also feel like different kids need different things at various points. This is a lesson, not just of education, but of parenting multiple children. Montessori would not have been the right fit for Jacob, and I am not sure if it ever will be. The developmental preschool through the public school system was a good fit for Jacob. We went through the IEP process and he started the 2011-2012 school year with 2 days/week. Jacob’s amazing, patient, smart, and caring preschool teacher helped advocate for him to go to school 3 days/week in the middle of the year. Jacob enjoyed going to school. He was fine getting on the school bus (so scary to send a 2-year-old on a bus, but he loved it). He came home from the half-day exhausted, but happy. The classroom is a language-rich environment, with therapy built-in to the entire program, in addition to more individualized speech, occupational, and physical therapy. Because many of the other kids in the class were also delayed in one or multiple ways, we decided to also put him in a regular preschool class at the JCC for the other 2 days/week. This way he would have some sort of school or activity every morning of the week (much easier for creating a routine), and he would be exposed to many different types of kids and learning environments. We did see Jacob make progress at school, but the progress was not as fast as we would have liked. By the time Jacob had his second IEP meeting at the end of 2011 (where we were requesting 3 days/week), we felt like his progress was stagnant. This was a familiar feeling with Jacob’s development. When he learned to crawl, it took him another 8 months to learn to walk, and it seemed to take forever. With his speech, we kept expecting a “language explosion”, but he spoke less than 10 words from his second birthday to two and a half. Progress just seemed so slow, which was so very frustrating and defeating at times. In addition to increasing his days at school from 2 to 3 days and adding the 2 days at the JCC, we changed his private speech therapy as well. We had been seeing a nice speech therapist at our home once a week from August 2011 to January 2012. I had suspected that Jacob may have Apraxia, in addition to some dysarthria and hypotonia. He fit the profile in a lot of ways and this speech therapist confirmed that he probably did have Apraxia. She really focused on building his mouth strength through focused exercises in chewing, blowing, and whistles. Just as Jacob had low tone in his body, his mouth was very weak as well. These exercises were like PT for the mouth. Jacob’s mouth did seem to get stronger, but this did not necessarily translate to improved speech. Jacob also did not always cooperate for these hour-long therapy sessions. Overall, we just felt like we needed to try something else. We had Jacob evaluated by a speech therapist in Virginia Beach (a 45-minute drive away) who was an Apraxia expert when he was 18 months old. She said he was too young to diagnose with Apraxia at that point. In January of 2012 I decided to attend an Apraxia support group meeting in Virginia Beach and I ran into this speech therapist again. She suggested I bring him back in for another evaluation. We did the evaluation and have been schlepping Jacob to Virginia Beach twice a week for speech therapy and physical therapy since February of 2012. Although this therapist does not think Jacob officially has Apraxia, she does agree that he has dysarthria and that the low tone affects his speech – it is just a lot more difficult for Jacob to talk than for other children. She is good – what all speech therapists should be! The drive is a pain, but worth it for good therapy that I finally feel is helping him. I had suspicions that Jacob had some food allergies or sensitivities for a long time. Even as a baby, with the severe reflux and eczema issues, I knew that dairy was a bit of an issue. I tried to alter my diet while nursing him for 7 months, but I could never pin point what exactly bothered him. When I stopped nursing, we tried him on regular formula, which he did not tolerate. He seemed to do better on soy formula, and eventually soy milk. We still gave him regular yogurt and cheese occasionally, which he LOVED, but it did not love him. If I noticed the eczema flaring up, I would try to cut back the dairy, but sometimes he would still have skin issues or crying fits at night even when the dairy was cut out. The other problem was that he seemed to crave dairy and would cry and throw tantrums at the fridge begging for yogurt or cheese. I understand that my job as a parent is to set limits and control the nutrition, but it is hard to constantly fight over food, especially when you can’t figure out exactly what it is that is causing the problems. He was also starting to refuse certain foods that he used to like – pizza, pasta, and some bread. 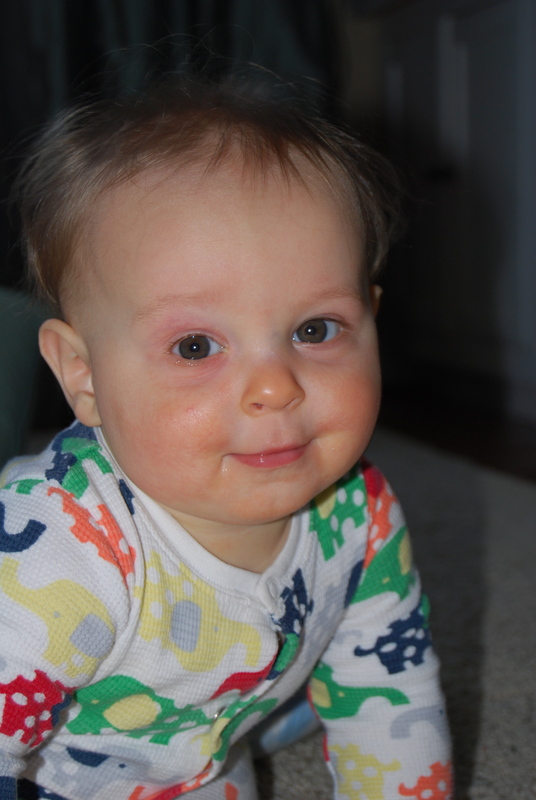 We took him to an allergist for skin testing at 18 months, but egg was the only thing he showed a slight allergy to. Needless to say, I really started to suspect some food sensitivities or allergies that may not have shown up on the skin test (not the best test for certain sensitivities or allergies anyway). I have always had an open mind to alternative sorts of treatment. I already had Jacob on a special fish oil that is supposed to help with myelination in the brain and speech, not to mention being healthy for you as well. Even though Les is a physician and I wholeheartedly believe in the benefit of Western medicine, I also don’t believe that the medical community (especially not any one particular doctor) knows all the answers. We had been to pediatricians, neurologists, developmental pediatricians, allergists, dermatologists, ENT, and several other therapists and nobody really had a clear idea of exactly what was wrong, what was causing the problems, and what exactly we should do to help Jacob. Although I do not currently think that Jacob is on the Autism spectrum, some of his issues share certain characteristics with Autism – speech delay, sensory integration/processing issues, and some of his GI problems. I had heard about parents that had “cured” (or at least significantly helped) their children on the Autism spectrum with the Gluten-free, Caesin-free diet (GFCF diet). I ordered six books on Autism and the GFCF diet and read them in one week. Why not try this special diet, since it may help his stomach and skin problems that I suspected may have something to do with dairy and/or gluten? There was plenty of information in the books and on the internet suggesting that speech and behavior improved on this diet as well. The new speech therapist in Virginia Beach was supportive and said she had personally seen significant improvements in kids on this diet, in addition to being helped by the diet herself. She also recommended more allergy testing by a different lab (Enterolab) to confirm food allergies or sensitivities. We tested Jacob with this lab and, as suspected, the results showed that he was allergic to Gluten, soy, eggs, and dairy. We eliminated the soy, since we had already eliminated everything else. I cringe when I think about how much soy Jacob has consumed (soy formula, soy milk, soy cheese, soy yogurt, soy sauce, etc.) over the past 2 years. After gluten, soy was the next highest score on his allergy tests. I am trying hard to minimize the mommy guilt over missing this and possibly contributing to any of his problems with the soy. We have really seen significant changes in Jacob since January. We have seen the most dramatic improvements in his speech. He probably has 50 words – maybe not easily understood by all – but 50 words and often tries to imitate other words and sounds. Jacob is also playing more like a typical little boy. I still remember the first time I saw Jacob playing with cars in a way you would expect a 2-year-old to play with them (about 6 months ago). I was so excited and proud that it brought tears of joy to my eyes. Now he regularly plays with cars, trains, and other toys the way I would expect him to. This is something you take for granted with neurotypical children, but such a big deal for kids like Jacob. It is almost impossible to say if any one particular thing has resulted in these improvements. I think the diet is probably the biggest thing that has led to the improvements. He does not wake up crying during the night (confirming my suspicion that his stomach was hurting), and his mood is so much better. He can still be a moody, grumpy and whiney toddler, but not nearly as unbearable as before. In addition to the diet, Jacob is certainly benefiting from 5 days of school/week, more frequent speech therapy with an excellent therapist, and time. He will be three years old next month. What a difference a year makes! There is still a great deal of work ahead of us. Jacob will be starting a new year of preschool in an integrated class at the local public school in the fall. We finished his IEP, and he will continue his speech, PT, and OT therapies while attending school 4 days/week. We will continue to go to Virginia Beach for private speech therapy and physical therapy. We have to work with Jacob every day on his speech. I would love for him to be putting 2 or more words together regularly and expand his vocabulary. I can’t wait to hear him sing songs and have a conversation with his brother and sister while playing. He still has some strange skin rashes that appear on his legs. We went to a dermatologist a year ago about this and did not get any answers. We need to go to a different dermatologist and push for a better answer. I continue to look for new things to cook and serve to Jacob to accommodate his food limitations. This diet does involve a lot more grocery shopping and advance planning on my part, but it forces me to make fresher and healthier meals for the whole family. In the next year I would love to see Jacob learn how to walk down stairs, pedal a tricycle, jump, and sit up in a chair for longer periods without slumping down. We have lots of goals and look forward to celebrating all these accomplishments and more. I am so thankful for the progress we have made and more hopeful than ever that my precious little boy is starting to shine through. Jacob is a sweet, resilient, funny, and smart little boy. He is such a special kid! Of course, I still worry about him every day and probably always will. I worry about all three of my kids, but my fear and concern for him is just different. I just want what all parents want for their kids – good health, happiness, and the opportunity to be independent and live a full life. Despite the stress and struggles along the way, I am so honored and proud to be Jacob’s mother. I would do anything for him. He has given us so much joy and taught us so much already in his first 3 years of life. I can’t wait to see what he’ll learn next and look forward to the journey ahead!